Adding & Importing contacts to your account - Desktop – Welcome to the NextMinute support and feedback centre. The contacts list is a place to store the contact information of business contacts you engage with for job management. This would include your Users (staff), Customers, Suppliers (these are built-in). We also give you the ability to create Contact Type tags to suit your business. 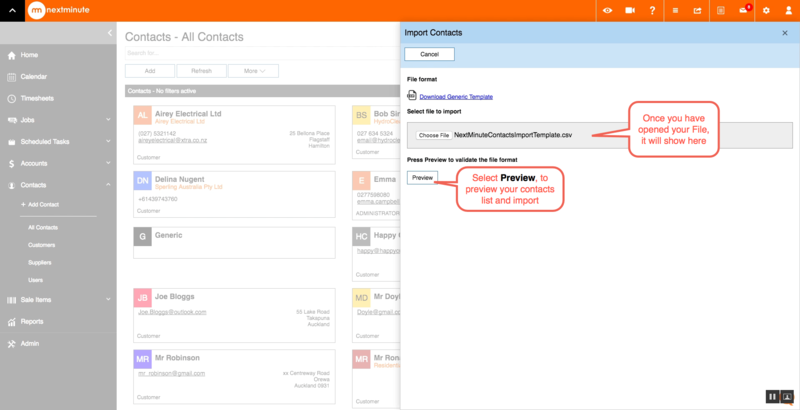 That way you can easily sort and filter your contacts as needed. See the Set up contact types article. Navigate to the Contacts on the left hand menu, see screen view below. 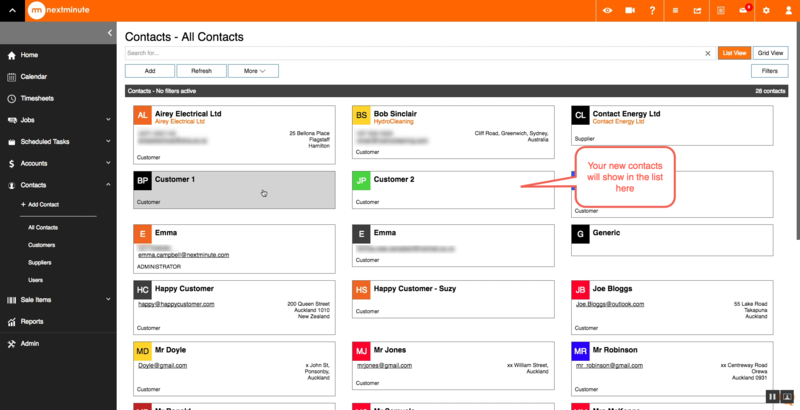 Select Add to input new contacts for your business. Or quickly add a contact by selecting the quick actions icon in the top right hand menu and select Add Contact. Enter your contact details, as shown here in the screen view. 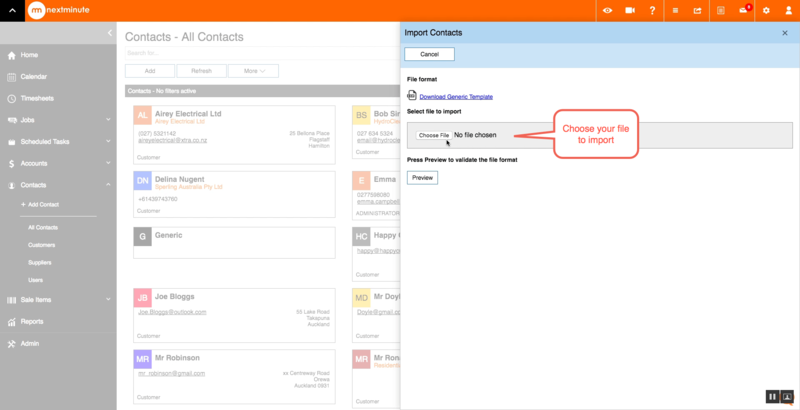 You also have the option to Import contacts. This speeds up entering a large list. Navigate to the Contacts button and enter Import. You will then see this view below. You need to download the Generic CSV file to view and prepare your contact data. Below shows what the Generic CSV File looks like. Note: any file created in Excel can be saved as a CSV (comma, separated version) file. 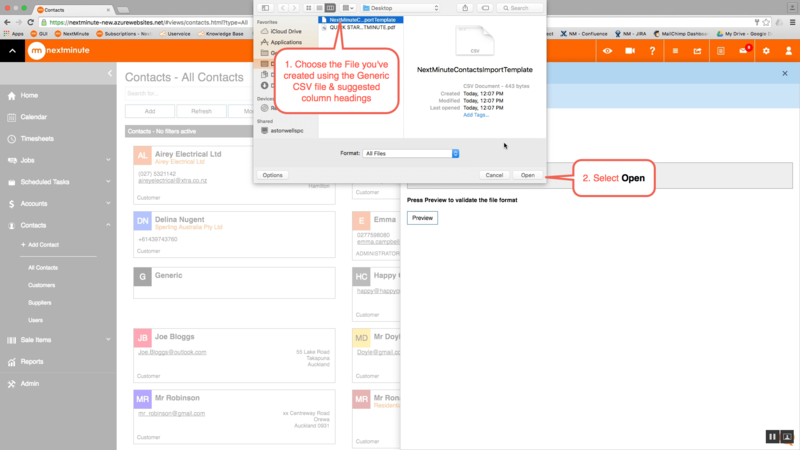 You will add and sort your contact information into the column headings set out. We suggest you copy and past the column headers to a new spreadsheet. 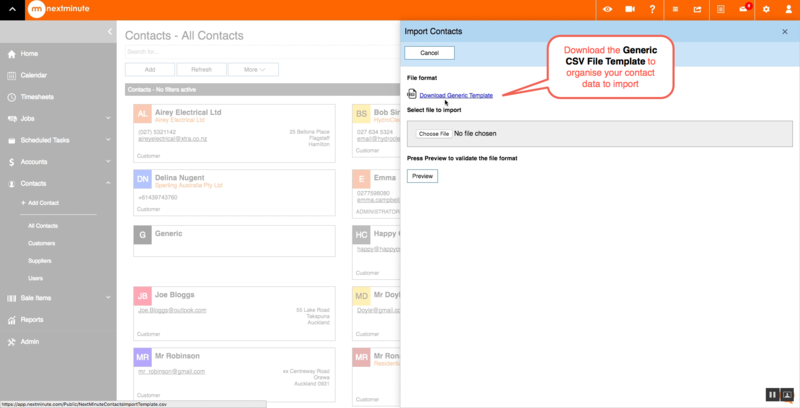 Then enter your contact data and save as a CSV file. Once complete, you then need to save to your local drive in ready to Import. Navigate to select the file to Import: Choose File, Open File and Preview, see screen views here. You will notice the file name of the chosen file will display, assuming you have the correct file you can now Preview. The Preview of Import Items displays as shown here. If you're happy with the data, choose Import. 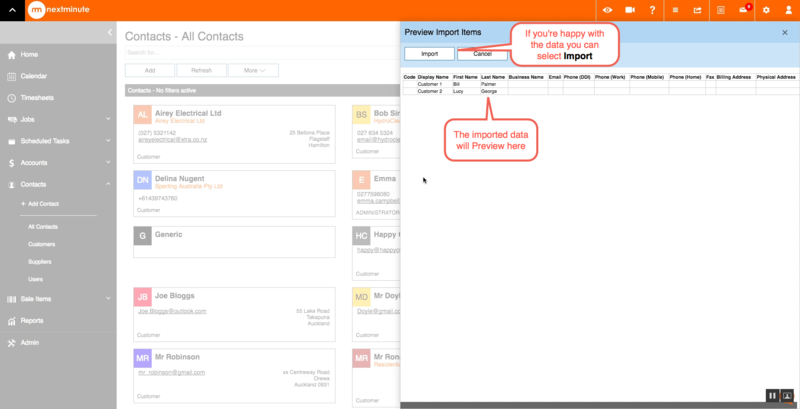 Your import will take a few seconds (dependant on the volume of data you’re introducing to NextMinute). Once the import is complete, you will be shown a confirmation at the top of the page like this. You may also want to view our Quick Tips: Filtering Contacts article and Setup contact types article. Thanks for reading this help article, we hope you found it useful. You can see more helpful articles at the NextMinute Knowledgebase.